Milk filling is our inspiration. 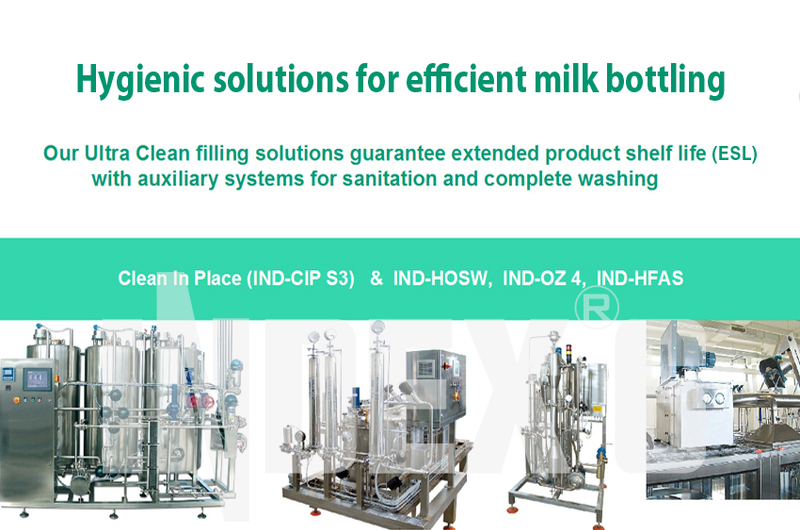 For bottling of fresh milk in PET or Glass bottles in ULTRA CLEAN environment INDEX-6® offers the models of AssetClean™ solutions, suitable for liquid dairy products, yoghurts, juices and other microbiologically sensitive products. The AssetClean™ 49 series - a synchrobloc in ULTRA CLEAN edition, equipped with all the necessary and specialized systems for filling of microbiologically sensitive products in sterile environment. A system, guaranteeing the conservation of the product for a long time - up to 120 days. AssetClean™ 49 provides for clean technology - a sterile environment ISO 5 is maintained in the filling and capping zone. The machine is equipped with a system for real-time control of the processes being performed. AssetClean™49 is flexible. Setting-up for work with different products and containers requires minimal time and is carried out using the specially designed functions that allow you to save the values of different parameters into predefined sets for a given product/container. Different configurations have been designed for the synchrobloc AssetClean™ 49, covering the capacity range of 60 bpm up to 400 bpm for containers/bottles with capacity from 80 ml up to 5 liters. - bottles and caps sterilization with ozonated water or hot solution of hydrogen peroxide Н2О2 followed by a thorough rinsing with sterile water. 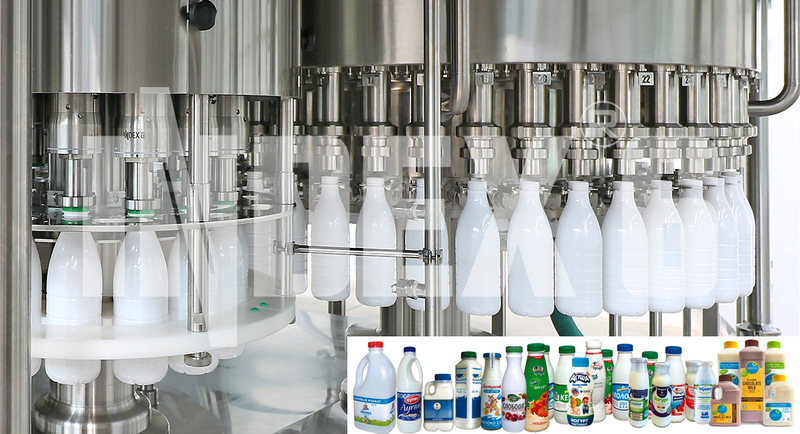 The different configurations of the synchrobloc allow for treatment time of the sterilizing fluid in the bottles and in the caps starting from the minimal 5.5 seconds and reaching a total 40-second sterilization. For this purpose two sterilizing columns for the bottles in combination with a linear rinser for the caps are used. - Highly inclined surfaces "Sloping Base", welded to the main frame and plate, that serve as the bottom of the machine working zone and provide for quick and complete lead-off of any fluids and faster drying of the machine surfaces. Every gram of the product is valuable both for the consumer and the manufacturer. The weight filling machines from the AssetClean™ series utilize load cells of the highest class. In addition the machine frame and base is designed in a manner that makes disturbances passed to the load cells negligible. For the precise control of the weight filling process we use complex software - the result of multiple modernizations over the years. 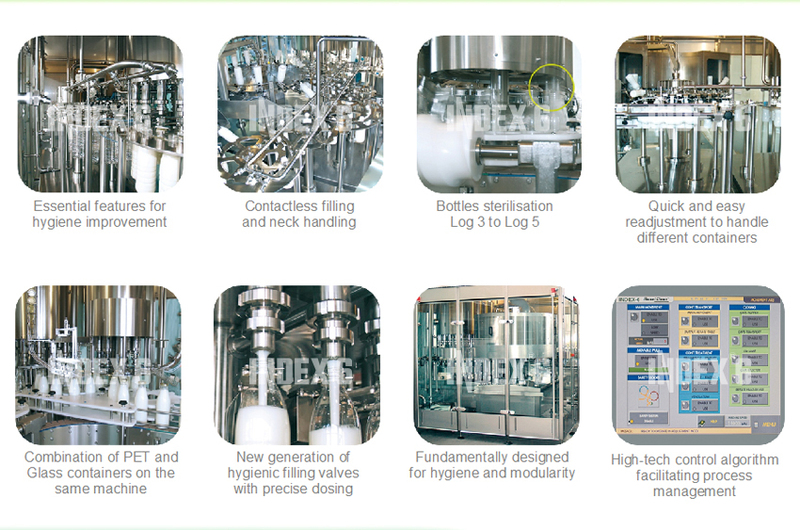 All this, combined with the special patented filling valve guarantees absolute precision of filling, providing accuracy of 0.3 to 1.2 grams, depending on the product type and container volume. - Freestanding fencing in safety glass, allowing 360° view to the machine, easy access for cleaning and maintenance for the machine and the floor under it. - Significant increase in the volume of sterile air supplied. - The color touchscreen makes the dialogue between operator and machine easy and intuitive. There is a possibility for monitoring the current status of the machine and its work parameters for longer periods of time.